Amorgos is also known as Yperia, Patagy, or Platagy, Pagali, Psichia and Karkisia. A long human presence on the island (5th millenium BC) has left many monuments and settlements behind, all of them characterised by sites of courageous beauty. The famous monastery of the is one of the most unforgettable sites of the Aegean – a lot of things to discover on Amorgos Island! 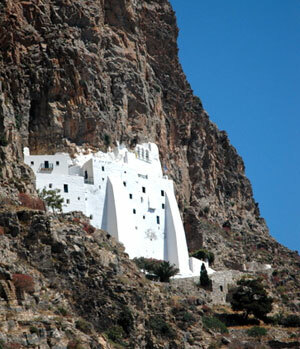 Amorgos Island (length 33 km, width 1.5 km to 6km) is located on the southeastern edge of the Cyclades. Its mountains, its impressive rock slopes, the mountain slopes where plants are cultivated, its steep coasts in the south side and the scenic bays with their beautiful beaches compose Amorgos landscape. 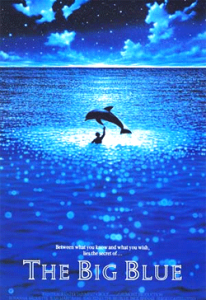 The well known cult-movie and freediving drama, directed by Luc Besson, was partly produced on Amorgos Island in 1988. 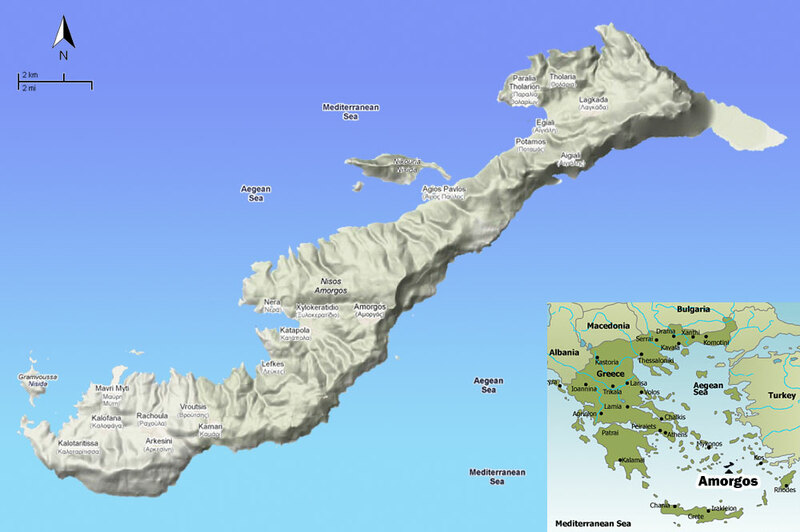 Production places were Chora, Agia Ana beach and Kalotaritissa bay. The stunning widescreen cinematography and intense, varied score by his regular composer, Eric Serra, give the film a unique flavor and an eerie resonance. Le Grand Bleu was the most financially successful French film of the 1980s and French tourists came to Amorgos to look for the unforgettable locations from the movie. In Amorgos you can try traditional tastes like “patatato” which is traditionally cooked lamb with potatoes, Easter “stuffed goat”, fava (split pea dip), kakavia (fish soup), xidato (goat meat soup with entrails), locally produced cheeses, pasteli (sesame bars), pure dairy products, honey and xerotigano. and local drinks such as rakomelo (hot raki with honey), psimeni raki (sweet drink with raki, honey and herbs and a variety of beverages made of herbs.